Cuddlebug is mad at me. Because of a thyroid condition, she has to eat special food—but she doesn’t know that. She just knows that PB gets to eat in the living room from a fancy earthenware bowl that gets whipped off the floor whenever Bug comes near. And it’s not fair that PB gets to have special stuff that she’s not allowed to even sniff. What my 19-year-old tortoise shell cat doesn’t know—aside from the fact that she has a condition—is that I pay extra for her food and can only get it from the vet. She doesn’t know that I take time to make a gravy out of that expensive food to make it more palatable for her. She doesn’t know that I also slice venison into bite-sized pieces especially for her, to take care of her coat and give her a special treat. I don’t do this for PB, who is a persnickety eater anyway. Just for Cuddlebug. All I do for PB is pour dry cereal into a bowl and feed her in a different room so Bug won’t eat it and get sick again. Funny thing is, PB thinks she’s the one getting the special treatment—except she does seem to wonder why she’s been banned to the living room to eat. She wants to eat in the kitchen like the big cat. Since I don’t speak Cat and they don’t speak English, I can’t explain that what I’m doing is for the best and that I love them both equally. All I can do is endure their jealousy of each other and their anger with me. I can’t afford to give them each their way because it will result in harm to one of them. 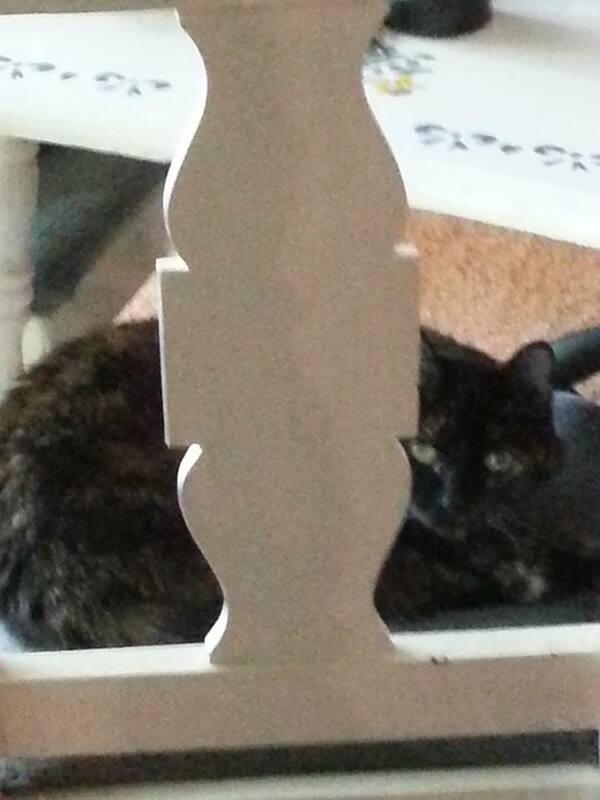 This morning, after our usual feeding ritual, Bug sat and glared at me. She’s on my lap now, so all’s well, but she was pretty ticked off earlier. Maybe this is how God feels when we compare what He’s doing for others to what He’s doing for us. There’s no point in Him trying to explain—not that He feels the need to explain Himself—because we wouldn’t understand anyway. So all He can do is endure our jealousy of each other and our anger with Him as He continues doing what’s best for us. Lesson? Don’t be jealous of someone else. Just be patient and see what’s in store for you. 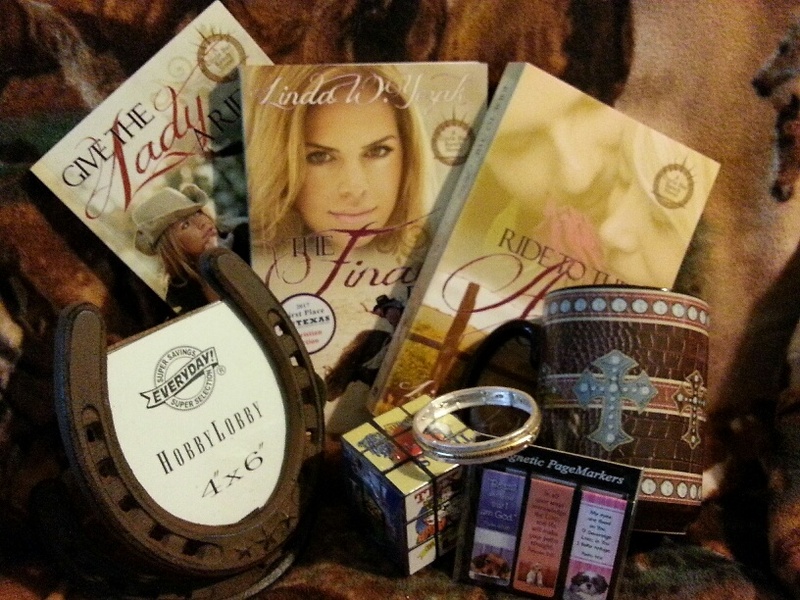 Linda is offering a giveaway package during this blog tour. When the two-week tour is over, all those who commented throughout the tour will be eligible for the drawing for the prize. It includes a signed print version of the series, a 16-ounce Christian cowboy mug, a horseshoe picture frame, a Ph. 4:13 stretch bracelet, a cute set of magnetic page markers, and a Texas Rubiks cube. Coming soon! The third book in her delightful award wining series The Circle Bar Ranch. Linda will be a guest with Lynn Mosher next. 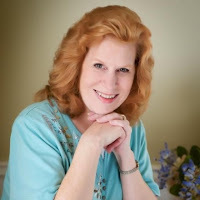 Be sure to stop by for another entertaining and inspirational post. Thanks for hosting me, Ceci. I hope your readers like my story! Oh, I love that! Hamish was a wise one! Thanks for the comment, Janet. Isn't this your second comment of the tour? Good luck in the drawing! I hope many get to enjoy your post, Linda, and have fun on the tour! I love your analogy . . . cats and people and God. 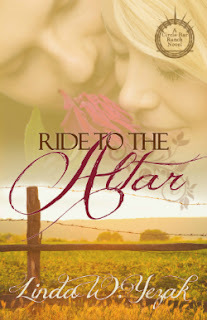 I hope your upcoming book, Ride to the Alter, is a great success! Congratulations! I'm sure it's a beautiful story! Any thoughts you would like to share? I love hearing from you!